What is professionalism, and what are professionalism skills? When I ask students, educators, or clinical instructors these questions, no two answers are alike—and no one responds with a textbook definition of professionalism. The responses overwhelmingly describe or define professionalism by what it does and doesn’t look like. In other words, we recognize professional behavior when we see it exhibited, and we notice when it’s absent. My experience in imaging suggests that definitions of professionalism usually can be distilled into three main categories: what we say, what we do, and how we present ourselves (our appearance). Educators can choose from three general approaches regarding their students’ level of professionalism. We may assume that, when we accepted our students into our programs, they already had the essential professionalism for which employers look. We can presume that our students will acquire those skills somewhere, somehow during their tenure on our campus or in our programs before seeking employment. Or we can teach, evaluate, and hold students accountable to the level of professionalism our industry demands. This article is for those who believe the first two possibilities are inadequate. 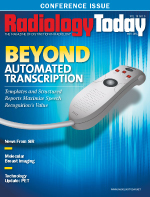 The first step in incorporating and teaching professionalism in radiology education is to identify those skills or competencies that programs, clinical sites, and the imaging industry in general require or value. How do you find out what these skills or competencies are? You ask those already working in the field. • is genuine and sincere in his or her work. While there were no real surprises in the responses, the major takeaway point for me as a program director and curriculum coordinator was that, out of all of them, only two could arguably be related to technical training. The rest had to do with what many would call professionalism, emotional intelligence, or so-called soft skills. That’s not to say technical skills aren’t important, just that they are presumed. Candidates must have them to obtain a position, but technical skills alone don’t identify the best candidates. When I thought about how the responses related to the curriculum map for our program, it hit me that the courses in our curriculum largely addressed technical training skills, which weren’t the ones deemed most important or essential by our hospital respondents. Little in our curriculum addressed the other 21 skills and traits that our industry deems essential. This disconnect between the courses we offered in our curriculum and industry expectations motivated our faculty to develop methods of teaching and evaluating professionalism skills that we could imbed in our curriculum to augment the required technical training. After buying into the idea that professionalism skills are essential for graduates to be successful in today’s competitive environment and that these skills need to be taught (or at least evaluated) by the program, the next logical step was to identify the needed skills and traits and to determine how to teach students these skills and in what course(s). The second step was to list courses in our curriculum and determine how these skills and traits could be incorporated into those courses. Not every course was well suited to incorporate any of the skills and traits, and some courses lent themselves to incorporate more than one. Also, some skills could be taught and evaluated in more than one course. Our third step was to determine an effective method to teach and evaluate a particular skill in the appropriate course(s), as shown in the table below. • An evaluation is done on every student at the end of every term. • The evaluation is performed on campus and in the clinical environment. • The evaluation identifies each student’s strengths and provides an opportunity to encourage them in their progress. • The evaluation identifies focuses for improvement, including the timeline in which the faculty expects to see improvement and identifies consequences for not making the required improvements. • The evaluation is used as part of each student’s grade. • Each student is evaluated either one-on-one or in a meeting with a team of two or three faculty members. In addition to the faculty evaluation, students are asked to fill out their own professional evaluation as part of the process. When students meet with faculty or a clinical instructor, they discuss both evaluations and any discrepancies that exist. Faculty then can discuss how students can close any gap between how they view their own progress and how the faculty view their progress. Professionalism is essential to a graduate’s ultimate success in securing a position. In this increasingly competitive employment environment, organizations demand employees who will demonstrate and maintain a high level of professionalism. Therefore, it’s essential that graduates acquire and demonstrate a high level of professionalism skills in their training. Each time a student or graduate from your program interacts with a patient, that patient may view the department, organization, your institution, and your program through that individual experience. How that student or graduate acts may directly reflect on all those entities. So, in addition to making every effort to give our students the best current technical training, preparing them for success includes developing and incorporating methods for teaching and evaluating professionalism skills. — Rick Hoylman, MM, CNMT, is an associate professor and the nuclear medicine technology program director at Oregon Tech in Klamath Falls.